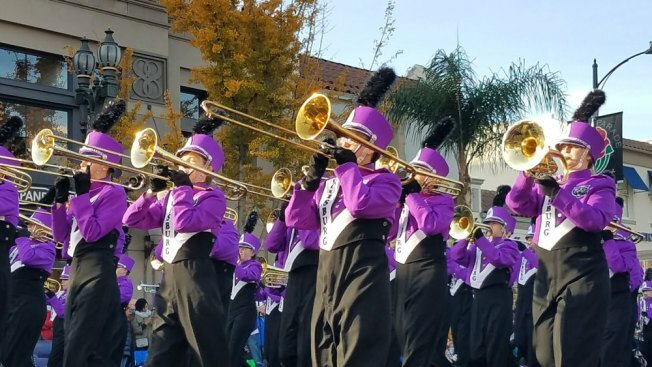 With a nod of thanks to military veterans, marching bands and floral floats took to the streets under sunny California skies as the 129th Rose Parade drew hundreds of thousands of spectators on New Year's Day and millions more watched on TV. Among the fanciful floats was an award-winning entry from China Airlines featuring a scuba diver floating above fish and a coral reef. Rock and Roll Hall of Fame artists Earth Wind and Fire performed atop a red and white float recreating the Forum, the famous Los Angeles-area arena celebrating its 50th anniversary. The annual extravaganza in Pasadena began with a military flyover and featured 39 floats decked out with countless flowers and waving celebrities. There were blue skies with just a few wisps of clouds and temperatures were expected to reach the 70s (about 22 degrees Celsius) after a chilly night. It has rained only once on the Rose Parade in the past six decades — that was in 2006 — and it has never been canceled because of weather. The theme of the 2018 parade is "Making a Difference," and actor Gary Sinise was chosen as grand marshal to lead the proceedings because of his devotion to veteran's issues. Sinise, who played Vietnam vet Lt. Dan Taylor in the 1994 film "Forrest Gump," said when he was picked that he was happy to serve as grand marshal because of the vets he seeks to help. "If shining a little spotlight on me on January first can shine a spotlight on them to help me make a difference in their lives, I am very, very grateful to do that," he said. Veterans and family members of those killed in action appeared on some of the floats. Spectators started lining the 3.5-mile (5.6-kilometer) route on Sunday, many of them camping on sidewalks and braving overnight temperatures in the low 40s (around 5 degrees Celsius). Pasadena Police Chief Phillip Sanchez said there were no known threats to the parade, and fan safety would remain the first priority and security would be tight. No major problems were reported. There were a handful of arrests, mostly for public intoxication, police said.